Congrats! Please send me an email with your mailing address and the 3 boxes of delish GoGo Squeez will be on the way! Thanks to the wonderful folks at GoGo SqueeZ for generously donating product and to all the Arm Candy fans that entered the contest!!! Have a wonderful Halloween weekend!! Results generated by Random.org here. The french are known for their culinary wonders. Their food has been pleasing palates all over the world for centuries. A few of my personal family favorites include: Foie Gras (Hubs’ favorite), Brie (one of my faves), Crepes (entire family fave) and as of late, the GoGo Squeez (kids favorite). 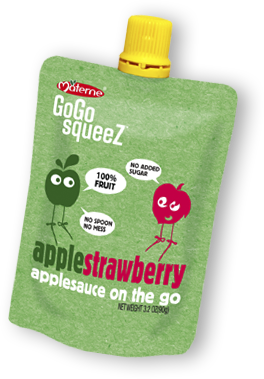 The GoGo Squeez is 100% fruit applesauce. Gluten and dairy-free and certified Kosher. Comes in a handy little resealable packet with built-in straw. I found these gems on AmazonFresh, however, you can click here to find out where they are available in your area or order from Amazon.